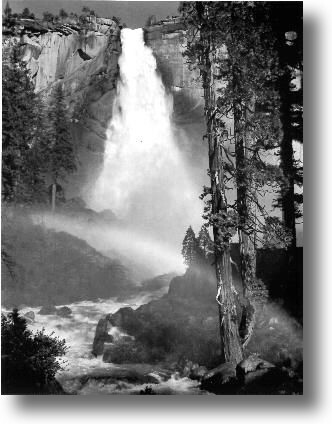 This picture was taken on a spring day around 1947 - though he was very meticulous with photographic detail and could remember details of exposures and development, Ansel Adams was not so good when it came to remembering the dates of his pictures - even to the year! His 8 x 10 inch view camera, two lenses, filters and six double film holders, along with the necessary tripod to set out to photograph Nevada Fall had been packed. The fall was in full spate at that time of the year, carrying the melt-waters from the winter snows, in particular the subject was to be the rainbow formed from the mist in front of the fall. The volume of water cascading over the fall meant that it was producing billowing clouds of mist that rolled down the canyon for over half a mile. He took the longer trail to get to his chosen viewing spot as he feared that the shorter Mist Trail that passed by Vernal Fall would wet his equipment. Adams still arrived hours before he knew that the conditions would be right for the photograph he wanted with the sun in the right position. He spent the time moving around the area looking for the best location, anticipating where the rainbow would form from noting the angle of his own shadow - the rainbow is formed at 44° from the axis of the sun. With the luxury of so much time available, he was able to set himself up in the perfect position with his camera and tripod so that braches and vegetation was ideally lined up in relation to the cliffs and waterfall behind. In particular he notes that "I had a particularly hard time with the small tree in the upper left corner of the image." A feature that many observers would have hardly noticed if at all, such was his perfectionism. Even so, setting up was difficult due to the nature of the terrain and eventually the tripod was arranged in a "...jumble of rocks". The camera was kept covered all this time as there was mist blowing out from the falls soaking the photographer and almost everything else with him. When all was arranged on the ground, the sun still had to move around to the ideal position and so Adams waited patiently. There would not be much time to get the picture he had visualized as shortly after it was in position, the sun would disappear over a ridge. Half of his film was colour and the other half black and white on this day. First the colour film was exposed, he had previously part-exposed the film in the studio as he had anticipated that the luminance scale of the subject would be beyond what was recordable by the colour film. The colour film used was amongst the first Ektachrome produced by Kodak for which Adams had agreed to do some field tests. Unfortunately the positives faded with time and there were no duplicates made on longer lasting film. For the black and white exposures, a coloured filter (Wratten no.8) was used and the water of the fall placed in zone 6 1/2 and made notes about the development, the developer and the paper used. Some have claimed that this picture is simply a photograph of some scenery and not art, an opinion that surprisingly carried little weight with the photographer. It is easy for those who are simply the observers of pictures, (rather than the creators) whether of art or not to be ignorant of the difficulties, subtleties and efforts that go into producing photographs like those of Ansel Adams. Perhaps it is a reinforcement of the photographers skill and dexterity with his medium that the observer can see the image and imagine themselves in the picture possibly producing the same image themselves. That very few have ever matched Adams photographs let alone surpassed them is indication that his photographs are far more than just being of "...a bit of scenery".